Investigate the murder of a tax collector in Seyda Neen. Chat with people about latest rumors to find out about the missing tax collector, Processus Vitellius. Find the body of Processus Vitellius in the wilderness northwest of town. Inform Socucius Ergalla in the Census and Excise Office. Chat with people about Murder of Processus Vitellius. Locate Vitellius' girlfriend, Thavere Vedrano. Find the murderer and collect a reward. Return Processus Vitellius' Ring to Thavere for an additional thank-you. When you're conversing with folks around town, you'll discover that the local tax collector, Processus Vitellius, has not been seen for a few days. If you wander through the wilderness near the water a short distance (within sight) northwest of town, you will come across his body lying among a cluster of rocks and trees. Alternatively, you can head due west from Fargoth's house. Collect the tax records, 200 gold, and some common clothes from his corpse and return to town. Go to Socucius Ergalla in the Census and Excise Office (the gentleman who let you pick your class) and talk to him about the man you found dead. It is recommended that you give back the gold you recovered from his corpse because you will be rewarded a greater amount of money later. Ergalla will ask you to find the killer of the tax man. Ask around town, and you'll learn that Processus had a girlfriend who resides in the lighthouse. Go and talk with Thavere Vedrano and learn that Processus recently had an argument with Foryn Gilnith. Furthermore, an examination of the tax records found on Processus will reveal that Foryn happens to have the largest unpaid tax amount. Find Foryn Gilnith in town. His shack is facing Fargoth's Hiding Place. Gilnith will admit to the murder and tell you that he believed that Vitellius was corrupt and was raising the taxes so that he could keep the extra gold for himself. It is up to you whether you spare Gilnith from the guards or turn him in. If you choose to spare him he will thank you and out of sympathy he will give you Processus Vitellius' Ring for you to return to Thavere Vedrano. Vedrano will then give you two Restore Health potions for returning the ring. On the other hand if you tell Gilnith that you will turn him in to the guards, he will become hostile, forcing you to have to kill him. If you kill Gilnith you will receive 500 gold from the Census and Excise office. You can also take Vitellius' ring from Gilnith's corpse and return it to Vedrano in exchange for two Standard Restore Health Potions. Or keep it - it's an Exquisite Ring, the best type you can find. You can either enchant it, or sell it to Arrille - with the money you make, you could buy three such potions with a little left over, or whatever else you want. It should be noted, however, that Arille does not often carry these at lower levels, so if the player is new and planning on walking to Balmora, the guaranteed two potions may be the best choice. If you confront Foryn Gilnith before going to the Census and Excise Office you get the reward and get to keep the 200 in taxes. You won't find any additional information when you talk with Thavere Vedrano; however, if you return Processus' ring, she will still give you the potions. If you kill Foryn (after accusing him) before taking the quest from Socucius, but after obtaining the record from the Taxman, you can get additional 500 gold from Socucius when you tell him you have dealt with the murderer. This means you can get 700 gold from this quest alone (excluding the exquisite ring). If you say that there was no money on the dead body the first time you speak to Socucius, you get to keep the money you found. Socucius will not ask you to find the murderer. If you kill Foryn anyway you will not receive the bounty. The Morrowind Patch Project closes the quest in this case. Without the patch, the quest will remain open indefinitely. There is a Mercantile skill book in Foryn Gilnith's shack, A Dance in Fire, Chapter 6, and an Unarmored skill book in the Lighthouse, The Wraith's Wedding Dowry. Make sure you read them both before you leave. If you choose not to kill Gilnith, the quest will not complete, and will remain in your journal indefinitely. Killing him after siding with him and then reporting to Ergalla will complete the quest as normal, however. After completing this quest, you can use Gilnith's shack as a house. You can sleep on the hammock and take anything you want to sell for gold, and use the storage devices to store your goods. This makes a good base of operations for exploring the area around Seyda Neen. 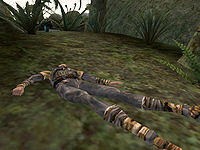 10 I found a corpse while traveling near Seyda Neen. It seems to be the corpse of one Processus Vitellius, based on some items found on his body. He is carrying a parchment with what look like tax records. He also had 200 gold on his body, probably taxes he'd collected. 20 I've spoken to Socucius Ergalla in Seyda Neen about Processus Vitellius. Socucius wants to know if I found the tax money he'd collected on the corpse. 30 I've told Socucius the truth about the 200 gold in tax money I found on the corpse of Processus. 40 Finishes quest I decided to keep the truth about the 200 gold I found on Processus to myself. Socucius was disappointed that the money had been lost, and saddened by the death of his tax collector. He thanked me for letting him know what had happened. 45 Socucius wasn't happy to hear I no longer had the 200 gold that were on the corpse. He's told me I should return when I have the money. 46 I've been able to get 200 gold to replace the money on Processus' corpse, and I've brought it to Socucius Ergalla. 48 He seemed impressed with my honesty, but confused as to why someone would murder Processus but not take his money. If I can find out who has done this, and execute the murderer, Socucius has promised to pay me 500 gold. 50 I've asked around town about the murder of Processus Vitellius. It seems he wasn't a popular person in general, which is no surprise, considering he was a tax collector. Some have suggested I speak with Thavere Vedrano, the lighthouse keeper, as she seemed to have some relationship with him. 60 Thavere Vedrano has mentioned to me an argument that Processus had been having with Foryn Gilnith. Apparently, there was some disagreement about the amount of money Gilnith owed, and how much he had really been making with his fishing. 70 Gilnith killed Processus, of this there is no doubt. He admits to it openly, and seems not in the least bit ashamed of it. Gilnith contends that Processus was corrupt, as are all the employees in the Census and Excise Office. He claims that Processus was attempting to gouge him on the taxes that were levied, and was taking a cut for himself, spending it on new jewelry and the like. 80 I believe Gilnith's story, and have decided to keep this knowledge to myself. Perhaps Processus was a corrupt man, perhaps not. It does not seem a good business to become more involved in. 85 I simply can't believe Gilnith's story, and even if it were true, it is no excuse for murder. 90 I brought the ring I found on Gilnith's body to Thavere Vedrano in the lighthouse. She was grateful to have something to remember her lover by, and thanked me by giving me two potions of healing. 100 Finishes quest After killing Gilnith, I reported my findings to the Census and Excise Office. Socucius seemed pleased to see Processus' murder avenged, and he paid me as promised. This page was last modified on 4 May 2018, at 10:41.